Interview with Otometrics North America Audiologists Don Kim, Jackie Phillips, Jeanette Fitzke, Keeley Moore, Melissa Lebon and Ellen Frederick. AudiologyOnline: Let’s talk about Otoscan. Before that, can you briefly describe the beginnings of digital ear scanning? Don Kim, AuD: Digital ear scanning started because the U.S. Navy was looking for a new solution that can provide optimal hearing protection. The traditional method was very inefficient. It required that military personnel get ear impressions made when they are off the ship which would potentially increase the noise exposure and then increase the chance of potential post-traumatic stress for warfighters. While waiting, the sailors wore generic ear plugs or other inferior hearing protection. 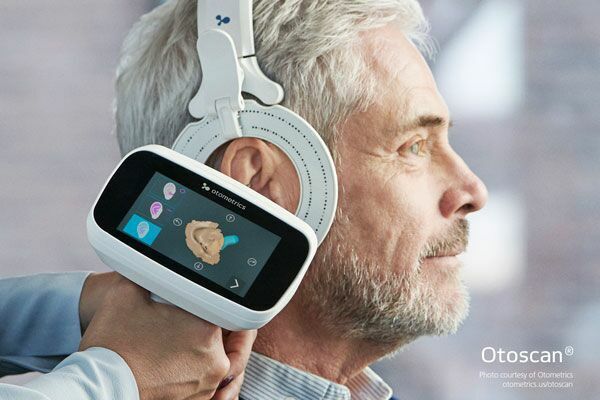 So in order to address this need, the Navy offered a grant―that was later awarded to a company who developed the earlier version of the technology that is the foundation of Otometrics’ ear scanning solution today. Jackie Phillips, AuD: On that note, Otoscan® today is based on the foundation of workflow efficiency. Today, it is a complete digital ear scanning solution that helps today’s hearing health care providers attract more patients and convert more patients while also delivering a new and more efficient level of patient care. 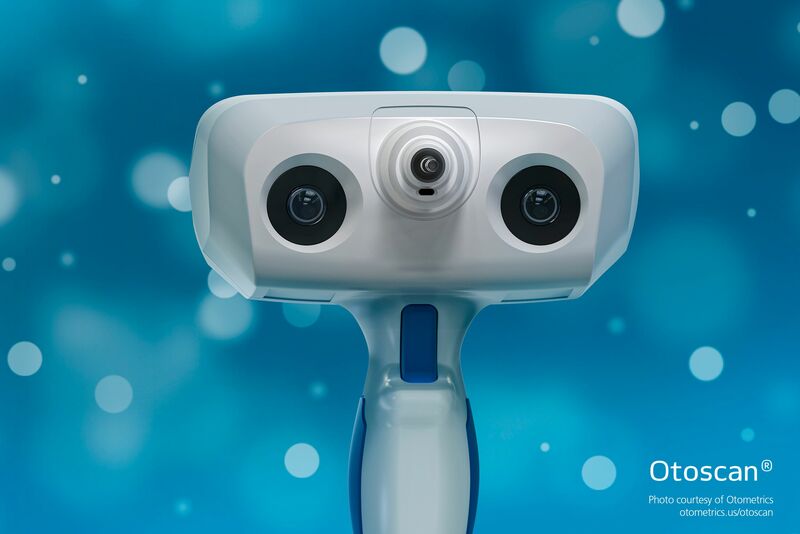 Otoscan 3D ear scanning is Otometrics’ newest technology developed by and for hearing care professionals as a tool to create engaging, personalized hearing care experiences. For audiologists who simply want an introduction to digital ear scanning with Otoscan, I recommend the Audiology Online course 3D Ear Scanning: The Future is Now! AudiologyOnline: So, is digital ear scanning a silicone replacement? Don: Otoscan speeds up the processes to support end-user satisfaction. 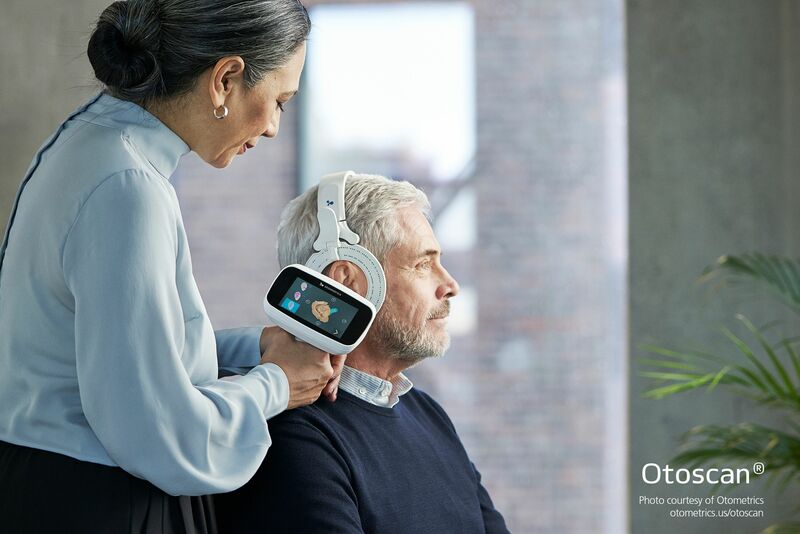 By incorporating digital ear scanning at the beginning of the hearing evaluation appointment, Otoscan creates a “wow factor” for the patient. Being able to visualize the live stitching of their own digital 3D ear creates more conversation and counseling opportunities. Practices who participated in our global pilot program in 2018 reported that 94% of their patients thought the ear scanning technology they experienced is exciting and interesting. AudiologyOnline: Digital ear scanning is a relatively new technology for most audiologists. How long does it take for an audiologist to become comfortable with scanning with Otoscan? Describe the training process. Jeanette Fitzke, AuD: Everyone is different but on average, it takes approximately 30 real ear scans to get to a confident level. Along with Jackie and Don, your dedicated Otometrics sales rep and Clinical Field Audiologist are available to guide the training process for new users. Our goal is to make sure clinicians are comfortable and confident in the new technology we are introducing into their clinic. We have developed a series of engaging training opportunities including a series of training videos to boost user comfort. Melissa Lebon, AuD: 3D ear scanning is a relatively new technology so, as trainers, we also went through intensive training ourselves. In my experience, the “Gamified Training Application” that is part of the Otoscan system was really helpful. Gamification is the process of integrating game mechanics into a learning process to motivate participation and engagement. Ellen Frederick, AuD: To Melissa’s point, I like that our Otoscan training software provides a progress report to gauge ear scanning readiness. The application also provides real-time feedback regarding technique. Like any new technology that has been introduced to audiology, it simply takes practice to get to a level of confidence. And we will be available to help fellow audiologists adopt digital ear scanning. Keeley Moore, MA: Audiologists can rest assured a comprehensive training program is in place, such as our new Hands-on Otoscan Training that is available for 0.4 CEUs. AudiologyOnline: Let’s talk about marketing your practice. 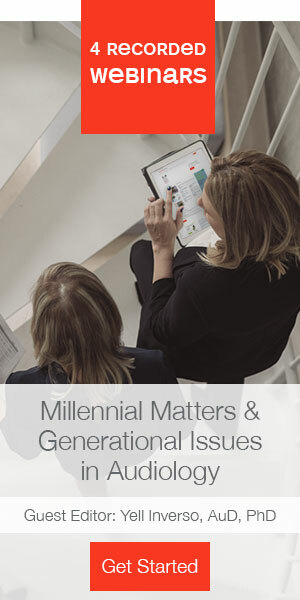 How can today’s new technologies help practice owners attract new patients? Keeley: Patients often identify state-of-the-art technology with professionalism. Create awareness within your community. Consider offering hearing care protection at your clinic. Think about participating next time there is a health fair at the community center by giving a presentation about the importance of hearing protection. Or contact the music department at a local high school or university and offer to introduce students to the importance of hearing protection. It’s a great way to start building awareness of your clinic and your services, as well as build your referral base. Jeanette: Providing a personalized experience can help you differentiate your clinic. Put yourself in your patient’s shoes when you are looking for a service provider. Continue to think of ways you and your staff can make your patients feel special as soon as they walk through your door. Taking the time to get to know your patient is always appreciated in the long run. Current and new hearing care technologies can help. Making your patient feel important through a more personalized experience creates trust and confidence in you and makes counseling easier later on in the amplification assessment process. sales process. Ellen: A positive word of mouth is invaluable to any business. A recommendation or positive review from a current patient is a great way to generate interest and attract new patients. One way to impress patients is to show them something completely new and different – something memorable that they can see or hear and talk about when meeting with family and friends. It could be a video of their own ear canal made with an otoscope. Or, a demonstration of amplification using real ear or speech mapping. It could also be the newest and most advanced technology within hearing care counseling, such as 3D ear scanning. The time it takes to personalize the experience will pay off in positive word of mouth – and more referrals – down the road. AudiologyOnline: Streamlining work processes makes good business sense. Can you share more timesaving ideas? Melissa: New integrated technology in the Aurical® ensures a proper fit and reduces remakes and returns. For instance, patients are less likely to return a properly fitted hearing aid. 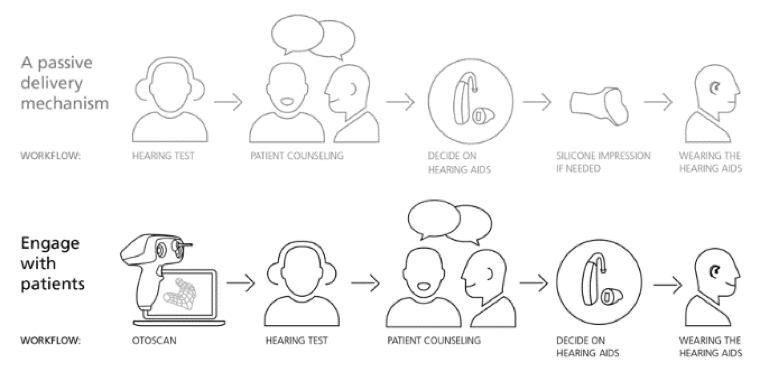 New integrated verification tools offered by Aurical (including IMC, or Inter Modular communication) allow you to provide a verified “match to target” fitting directly from your hearing instrument programing software. And, if you have a tool like Otoscan, you can reduce remakes and returns by making sure your custom-fit products fit from the start. Keeley: Take advantage of new advances in hearing care and automate as many processes as possible. There are new developments in our industry that can transform the way you provide hearing care. The arrival of PC-based diagnostic and fitting equipment like those operated with Otosuite® integrate easily into Noah (or into your EMR or Office Management System), eliminating the need for manual data entry or scanning of results. Don: Before joining the corporate world, I owned and managed my own practice. So thinking outside-the-box… what if you can enable assistants to perform routine tasks that do not necessarily equate to revenue generating activities? Practice owners can consider hiring an assistant – or training a current employee – to help with time-consuming tasks that don’t require a clinician’s level of expertise or take you away from patient care. For example, an assistant can handle the manual processes, logistics and paperwork associated with sending in hearing aid or earmold orders, cleaning hearing aids and replacing receivers instead of sending hearing aids out for repair or requiring your valuable time. Consider setting up a walk-in repair clinic. With the time saved, you are now able to schedule more appointments, spend more time counseling or help more patients. Otoscan provides a depth gauge for the scanner to use as a reference point for how deep they wish to scan. The Target Depth Gauge incorporates data on the average male and female ear canal lengths in addition to the recommended depth of scans and earmold impressions from hearing instrument manufacturers. Just imagine the reduced liability if we could eliminate the dangerous instances of accidentally injecting earmold impression material past the Otoblock and potentially onto the tympanic membrane. With this potentially reduced liability, organizations could then consider a more efficient staffing strategy that could incorporate technicians and assistants in the ear scanning process. AudiologyOnline: How can counseling elevate the patient experience? Jackie: Counseling boosts confidence and builds trust. It can help your patients feel that you’re the right professional to help them. Using the latest and most advanced technologies demonstrates that you take your patients and their challenges seriously. Listening to your patients’ specific needs and basing your diagnostics around them is an effective way to build connections. Counseling also helps patients become confident that amplification will improve their lives. Jeanette: Counseling creates the opportunity to discuss expectations from the beginning of the appointment. An important part of counseling is discussing and aligning expectations. And, it’s important that patients understand what to expect upfront rather than at the tail end of the counseling process. Conduct all the assessments required for a professional counseling process to uncover any unknowns early in the process. 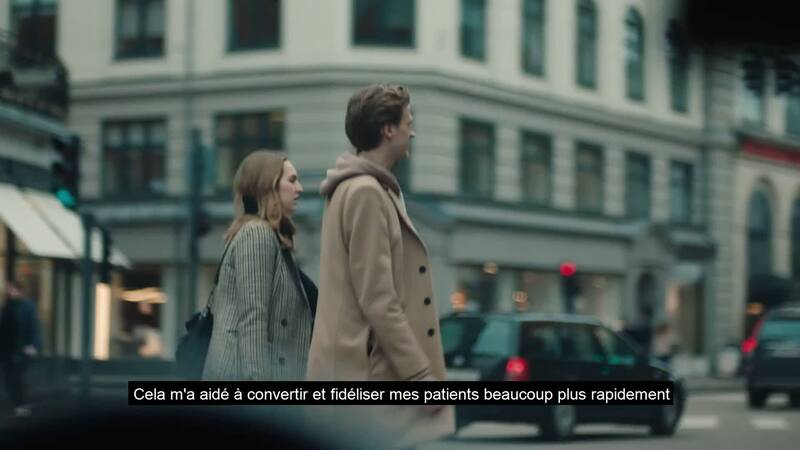 Discussing expectations early on means your patients will understand their amplification and hearing aid choices and be happier with them in the end. Don: Counseling―that personalized attention―ensures that your patients will return to you. You know that working with patients to fine tune their hearing aids to suit their preferences and lifestyle is part of every successful fitting. Make sure they know it too – and that they understand that returning to your clinic for adjustments is not only allowed, but strongly encouraged. But what if they don’t buy a hearing aid on the first visit? Establishing loyalty and trust through counseling and a personalized experience with the professional helps to anchor your patient to your clinic and makes it more likely that the customers will return to your shop, even if you do not make the sale on the first visit. AudiologyOnline: Let’s wrap this up with why should a practice owner consider adding Otoscan to their workflow? Jackie: Otoscan can help generate excitement and attract new clients. Deliver customized hearing care and differentiate against competition. Complement your professionalism by deploying cutting-edge technology. Reach more patients and grow your referral base through community health care events showcasing the latest innovation within hearing care. Melissa: Otoscan is a tool to please more patients. Audiologists can use Otoscan to create engaging, personalized experiences and convert and retain more clients. Don: Using Otoscan can also reduce liability with less invasive digital scanning. We have developed technology that could provide a less invasive way to make custom devices. Ellen: Convert and retain more patients by personalizing the hearing care experience. End with better care outcomes and fewer returns. Keeley: Otoscan digital ear scanning can contribute to a more streamlined process. For example, you can upload accurate 3D digital files to the Otocloud portal and save time, and money when you deliver custom hearing aids. In fact one of our customers, Peter D. Sotiropoulos, Au.D., the owner of Hearing Rehabilitation Center in Illinois, shared that Otoscan kept the ear mold turnaround time to a minimum. He went as far as saying it helped decrease our shipping time and cost by fifty percent. That’s a huge time and cost savings to consider. Jeanette: More importantly, in the age of over-the-counter (OTC) hearing aids and apps, providing a personalized experience for your patients not only boosts patient satisfaction, it can also help differentiate your clinic from your competition down the street. Talk to your local Otometrics sales representative to schedule a live demo. Explore the many ways Otoscan can support you in adding value to your clinic. Thank You, Otometrics. Read more on Otometrics’ Expo page or otometrics.us/otoscan. Don Kim, AuD, serves as the National Key Account Manager, Otoscan for Otometrics, a division of Natus. In this capacity, Dr. Kim works closely with National Key Account Manager Jackie Allen Phillips, AuD, and a team of Field Clinical Audiologists to lead customer education and training specific to the Otoscan 3D ear scanning solution. Previous to his current role, he was a Field Clinical Specialist for Otometrics where he has trained over 1000 providers and given over 200 National and Regional presentations and lectures on a variety of Audiology, Vestibular, Telehealth, and Business related topics pertinent to the hearing and balance healthcare industry. Prior to his corporate career, Dr. Kim has gained experience in a variety of practice and clinical settings. He has owned a private practice and served as Director of Audiology for several clinics where he has been responsible for the business growth, development of audiology protocols, and optimizing the business/workflow within the clinic. In addition, his experiences have awarded him the opportunity to lead two start-ups in the audiology industry. Dr. Kim received his Doctor of Audiology degree from East Tennessee State University and obtained his Bachelor in Science in Mathematics from Birmingham-Southern College. Dr. Kim received his Doctorate in Audiology from East Tennessee State University and his Bachelor of Science degree in Mathematics from Birmingham-Southern College. Jackie Allen Phillips, AuD, serves as the National Key Account Manager, Otoscan for Otometrics, a division of Natus. In this capacity, Dr. Phillips works closely with National Key Account Manager Don D. Kim, AuD, and a team of Field Clinical Audiologists to lead customer education and training specific to the Otoscan 3D ear scanning solution. More specifically, she is responsible for developing corporate and key account relationships; which includes establishing structure, governance, and guidance as well as driving and leading selected corporate and key strategic accounts. Prior to joining Otometrics, Dr. Phillips worked with Siemens Hearing Instruments in various roles, including Senior Manager of Government & Contract Services, and Senior Account Representative. Before working on the manufacturing side of audiology, Dr. Phillips worked 7 years in a clinical capacity for Houston Ear, Nose, and Throat Clinic. In addition to her bachelor of Science degree in communication disorders from Stephen F. Austin University, Dr. Phillips holds a master’s degree in audiology from Lamar University and a doctorate of audiology from A. T. Still University’s Arizona School of Health Sciences. She is currently a member of the American Speech Hearing Association and American Academy of Audiology and holds her Clinical Certificate of Competency in Audiology. Jeanette Fitzke, AuD, joined Otometrics, division of Natus, in February 2015 as the West Regional Field Clinical Audiologist where she has trained several providers and given multiple local, state and national presentations and lectures on a variety of Audiology, Vestibular, Telehealth, and Business related topics pertinent to the hearing and balance healthcare industry. She has 17 years of clinical experience in such settings as ENT, hospital, and multi-specialty clinics where she worked with a variety of age populations and focused on diagnostics, hearing aid services, vestibular care, and electrophysiological testing. Dr. Fitzke obtained her B.S. from University of Arizona, M.S. from Arizona State University and AuD from A.T. Still University. She is currently a member of the American Speech Hearing Association and American Academy of Audiology and holds her Clinical Certificate of Competency in Audiology. Keeley Moore, MA, CCC/A, is a Field Clinical Audiologist at Otometrics, a division of Natus, where she acts as client liaison for product support as well as offer clinical education and training. She has more than 15 years of experience as a practicing audiologist. She joined Otometrics from the Illinois Early Hearing Detection and Intervention Program, where she was an audiological consultant. While there, she played a key role in training and supporting lay hearing screeners, which included teaching OAE hearing screening courses and leading practicum for lay screeners. Prior to that position, Dr. Moore was a clinical and educational audiologist with a non-profit speech and hearing clinic. In that position, she served a diverse patient population and performed pediatric through geriatric behavioral audiometric assessment; and implemented habilitation and rehabilitation services. She also performed hearing aid and FM selection, fitting, verification, and management. Additionally, she counseled and taught advocacy skills to parents, students, and professionals, among many other responsibilities. She has also worked in ENT clinics and hospital environments; and is skilled in a broad spectrum of audiology and vestibular practices. Dr. Moore served honorably in the United States Marine Corps from 1985 through 1990, as a non-commissioned officer. She holds a B.A. in speech and hearing sciences from Indiana University, earning her Masters in Audiology from The Ohio State University. She holds a certificate of clinical competence and is certified by the American Board of Audiology. Melissa Lebon, AuD is the central region Field Clinical Audiologist at Otometrics. She joined the team in July of 2017. Prior to joining Otometrics, Dr. Lebon was part of the Professional Services Department at Unitron, where she provided hearing aid and software support to their customers. She also worked in a private practice clinic providing general audiologic diagnostics and hearing aid fitting. Dr. Lebon earned her Doctor of Audiology from the State University of New York at Buffalo and her Bachelor of Applied Science in Communication Sciences and Disorders at the University of Minnesota, Duluth. She is currently a member of the American Speech Language Hearing Association and holds her Clinical Certificate of Competency in Audiology. Ellen Frederick, AuD, is the field clinical audiologist in the Eastern United States for Otometrics, a division of Natus. Dr. Frederick has gained experience in a variety of practices and clinical settings working with neonates through geriatric individuals. Her experience includes diagnostic testing, vestibular evaluation, tinnitus management, hearing aid fitting, and research. She has worked in several private audiology practices, otolaryngology practices, and University medical centers where she has been responsible for the business growth, development of audiology protocols, and optimizing the business/workflow within the clinic. Dr. Frederick received her Doctorate in Audiology from Arizona School of Health at A.T. Still University.